At present, the management systems of companies and Industry 4.0 are closely linked. 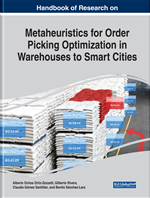 However, technologies that promise to drastically help the efficiency of operations are not implemented in production floors and specifically in warehouses. This chapter shows a methodology of bibliographic search that determines the most recent optimization algorithms and with greater occurrence within the scientific literature. Editorials and scientific journals are also taken into account. The information is analyzed and shown in the conclusion part of the work. The conclusions indicate the hybrid algorithms with greater publication, their characteristics, the different types of metrics used for the implementation of optimization systems in production environments, and the secondary support algorithms used to cover the performance weaknesses of the main algorithms. First, it is important to give the context of the stores within the maquiladora industry and the stores of small and medium enterprises in Ciudad Juárez. In the case of manufacturing industries, the warehouse is managed as part of a complete production system, of which the production warehouse is part. The complete system considers from the purchase of raw material or sub-assemblies to the delivery of the final product. Topics of industry 4.0 are mentioned in recent times in relation to the handling of inventories, such as Artificial Intelligence, portable devices (wearables), data analysis, Internet of Things (IoT) and Cloud (Cloud) (Forger, 2018), but these do not end up being integrated into the real practice of the industry. The first type consists of those elements such as the raw material or sub-assemblies necessary for the production or assembly activities. Finished product that reached the required quantity ready to ship to a distribution warehouse. It should be noted that the locations of these three types of items in storage can be separated, although they are usually located within the same area. All the articles that enter a production warehouse are grouped in boxes or “pallets” that are attached a label with codes that contain information regarding the product, the date of receipt, quantities, and an identification code for each box or pallet. Regularly the flow of warehouses depends on a system known as ERP system (Enterprise Resource Planning), this is an integrated system, which covers all the processes of the company and shares data among all departments, has a unique database and manages Real-time data (Forger, 2018). In the border region, the use of an ERP computer tool known under the SAP brand (Systemanalyse und Programmentwicklung, for its acronym in German) is widespread. The company's planners control the internal product orders to be produced, and this information is what triggers the floor management to comply with the orders, causes the production managers to request the assembly elements and consumables from the warehouse, recover quantities of product previously reserved in stock (stock) and, again, the planners control the output of the finished product to the distribution center. From the general point of view of the production system, the warehouse process is a necessary management process that does not add any value to the product, because it does not modify any of the product characteristics that the customer values ​​or perceives as added value. An expense is considered as the time that the elements for production or finished products are inside the warehouses without moving. As it is not a productive process, the warehouse is considered a single intermediate step between production lines and distribution centers. Depending on the size of the order, it is directed to the location accompanied by a manual transport cart, or a motorized cart that drags other manual carts, or a forklift truck. Wait to receive a new order and repeat the cycle. In figure 1, the cycle of the described steps is illustrated.